These are the heartbreaking images of a dog on life support before she died from eating chocolate brownies. 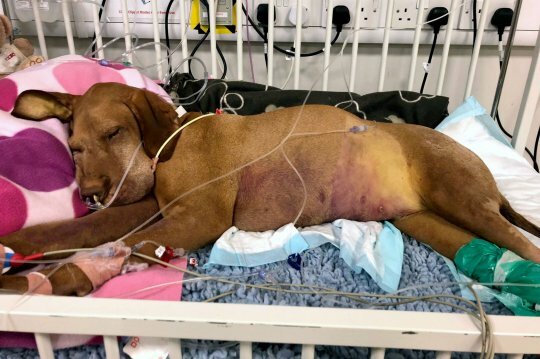 Ruby, a Hungarian Vizsla, had cheekily stolen two brownies which contained Xylitol, a form of sweetener, which is toxic to dogs and can cause liver failure. Just 36 hours after, she became ill and deteriorated over the next week. Owner Kate Chacksfield, 51, was left heartbroken when Ruby died on October 19 2018 just eight days after falling ill – despite her owners spending £10,000 in a bid to save her life. Kate is now sharing her story to raise awareness for the dangers of dogs consuming natural sweeteners. Kate, a media and presentation coach from Acton, West London said: ‘I only made brownies with Xylitol in to reduce the amount of sugar I was eating. ‘But while I was out, Ruby managed to get into the container off the side in the kitchen and eaten a couple. ‘She seemed fine at first and it wasn’t until a couple of days later she began being violently ill and I took her to the vets. ‘I had no idea how serious eating natural sweeteners was for dogs, the photos of her on life support still make me cry. As Ruby’s condition began to deteriorate, she was taken to The Royal Veterinary College, London, but died of liver failure and a suspected stroke. 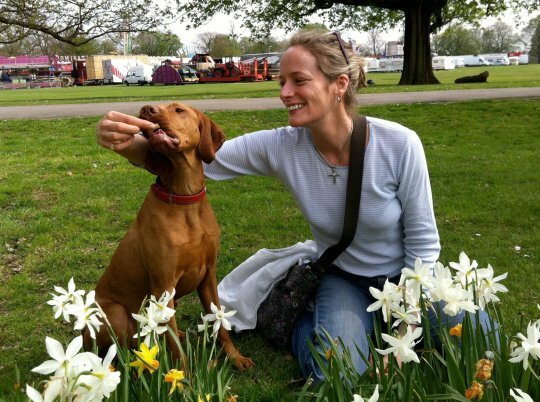 It wasn’t until after Ruby’s death that vets asked if she may have consumed Xylitol which is when Kate realised her health deterioration was linked to the brownies. She said: ‘I had absolutely no idea Xylitol was harmful to dogs what so ever and I was heartbroken when they told me and I knew it was too late for Ruby. ‘I really, really urge other dog owners to read up on the dangers of Xylitol in dogs and urgently take their pets to the vet if they accidentally consume it as it could be the difference between life and death.’ Xylitol sweetener can be found in many products such as sugar free sweets and gum, some baking mixes, peanut butters and chocolate.